Today I am participating in Joyce's (I Love Pretty Little Things) Friday Pretties. I've been going through my china for the upcoming bridal shower I am hosting in June. 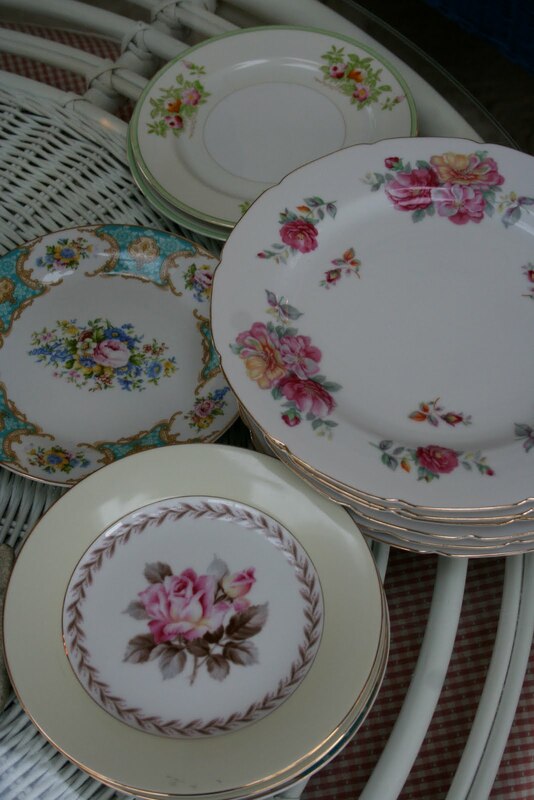 I love mismatched china, it all works like the different flowers in the garden. I love the way the tea cups look on the crocheted table cloth against the red toile walls. I could sit in this room and drink tea all day. My weakness for china is only surpassed by my weakness for fabric. Such a gentler, kinder time these beautiful pieces were created in. To make a plate of these lovelies! Be sure to stop over at Joyce's today for more pretties! So many pretties, Renee. I wanted to join Joyce, but don't have time to post tonight. Going out of town tomorrow for a couple of days. 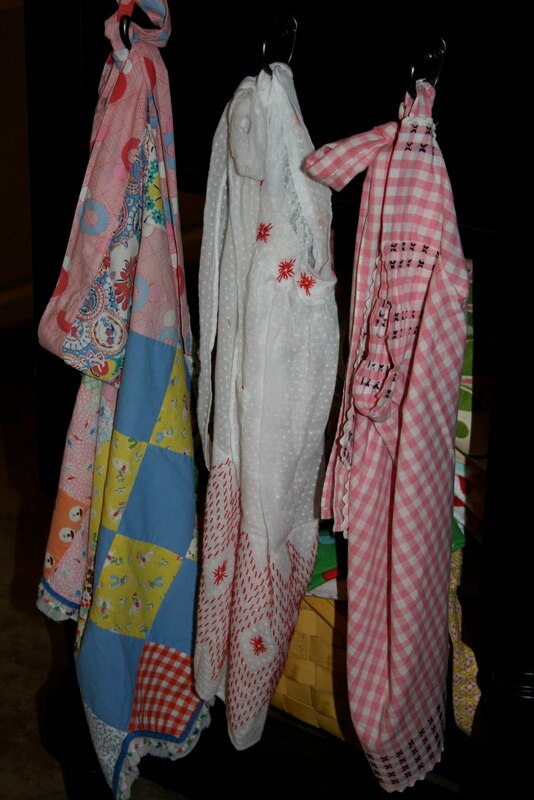 I love vintage aprons and wish I had not sold all of mine. Your mismatched china will be so "pretty" for the bridal shower. I love mismatched china and yours is so pretty! Love the pink depression jug as well. Have a lovely weekend! I just read Alma post, and she's talking about old and pretty dishes as well. Here's the link http://blackbird-designs.blogspot.com/. I think you two are onto something great; I will look at the dishes at the thrift shop with new eyes now. Oh Renee!!! Pretty as usual! I love the china and Chelsea is going to have the Prettiest shower ever! Thanks for playing along with my "Friday Pretties"! ohhh, such lovely mismatched china!It will be perfect for the shower! If you've gotta have a weakness and don't we all, you've gotta a couple wonderful weaknessnes! Thanks for sharing with me it reminded me of my special grandmother who had such beautiful china and was also a wonderful seamtres, she always had stacks of beautiful fabric waiting to be turned into something of wonder.Enjoy the day! A lot of pretties here on you blog !!! Beautiful blog you have !! Oh, lovely! I love mismatched china, too, it's so pretty! I like the idea of putting little tealights in teacups for a centerpiece, as well! 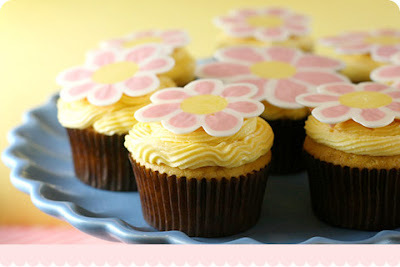 Anyway, I came over from I Love Pretty Little Things, sweet little blog here, I'm definitely following! Cheers! My oh my....I could just come live at your house. I love all that vintage goodness. So, so pretty. Your china is absolutely gorgeous. I love to mix and match. It is so much more fun and interesting!!! So pretty!!!! I love the mesuring cup. Seeing all your pretty things makes me want to come over and a cup of tea with you. 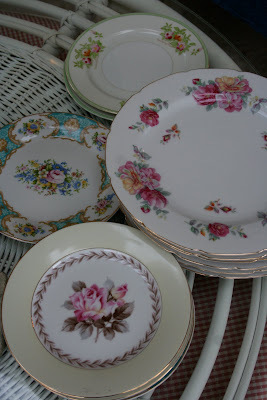 Dear Renee, I have loved your blog, and loved your mismatched china!!! And have browsed through your blog to find you are a so talented sewing woman, your quilts are so lovely and all the other things I have seen... and your garden is promising a paradise in your home, so beautiful!! I have never could managed to add a translator but I have found that there are other ways to translate which are in the upper bar of the computer. I love the roses plate! Just gorgeous. I have a few dessert plates like yours. 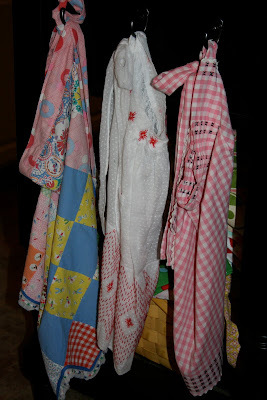 Did you see my post where one lady tied the vintage aprons to the back of the chairs? So cute! I know it will be beautiful. Bridal showers are so much fun to do! Very beautiful "Friday Pretties"! That is going to be one memorable shower!! Lucky girl!!! Just catching up here...I am so sorry to here about your friend! Will be praying for you and her family. The garden is looking quite lovely!!! and I just love your "pretties"!! !